Don’t worry, I’ll save my rendition of Michael Jackson classics for later, but I thought that the opening verse of Thriller would get us in the mood for tomorrow because it’s Halloween! Now, let’s be honest, I am usually not a massive fan of Halloween. I hate fancy dress, it just makes me feel like an idiot, and the whole trick or treating thing, well that is just as awkward for me, but with Amy getting older I thought it might be nice to ehm get a little more into it. I’m not going to push the boat out and spend five hours on my outfit for a Halloween party, but I got Amy a little costume and we’ll be having a little Halloween party with her cousins tomorrow. They’ll all get to dress up and have fun together and I’m escaping teenagers trying to raid my well hidden sweet stash. 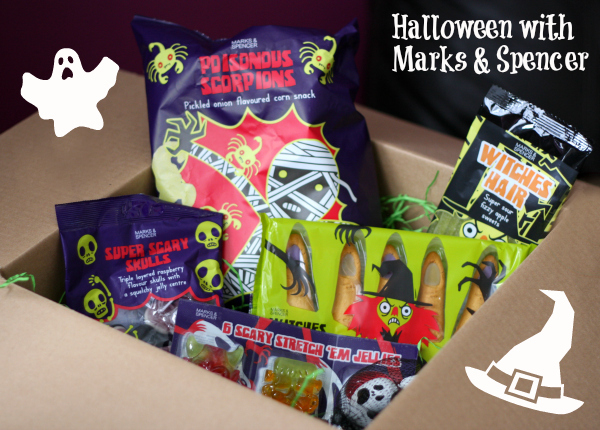 I might scare them with some of the scary treats from Marks & Spencer’s Halloween range though. We were kindly sent a big box full of goodies (see above) and they’ll really add a great touch to our little ghostly get together. With prices between £1 and £2, they are super affordable too, so make sure to top up on them in the morning or ready for your party at the weekend. I can’t wait to try them all out – shh don’t tell anyone that I’ve had some sneaky witches hair! Disclosure: Marks & Spencer kindly send us some treats to try, but they didn’t ask us to write about them. I have been tempted by the witchy fingers all week but they look a little too similar to my own (non-witchy just worn) for comfort! I LOVE M&S and I LOVE those prices too! They are really reasonably priced for what is undoubtedly good quality goodies!! Very jealous!! They look fab, we actually bought some from M and S yesterday! I was going to leave a comment but I need to just go to Marks and Spencer to buy some sweeties. Love them – I had a box too – the witches fingers were SO tasty! Enjoy! The Witch Fingers look great, what brilliant vale too. How fab, love M&S we have just got one attached to the petrol station and we have been enjoying marks for dinner! I hope you have had a great evening – they look very tasty. I tend to buy my outfits tomorrow in the sales for next year – much cheaper. We have so much sugar in our house! I never want to run out, but we only had a couple of visitors so in addition to the kids stash I have a huge bowl of sweets to get through! I bought a load of these for half price or less when I was shopping in M&S yesterday! Lovely!